Winner of 2003 Swing Journal Jazz Disc Best Production Award! By the time this album was recorded in 2002, veteran pianist Eddie Higgins had become one of the most popular pianists in Japan, thanks in no small part to the independent label Venus Records. 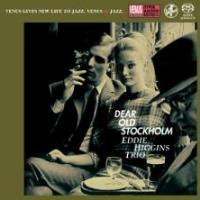 To commemmorate its 10th anniversary, Venus asked its fans which songs they would like to hear the Eddie Higgns Trio perform in their new album. Higgins chose 12 songs out of the top 25 and added two of his own choosing. It might be interesting for you to learn what songs are preferred by Japanese jazz fans. With a lot of ballads, this is in most part a mellow, relaxing album. Supported by the deep, tuneful bass of Jay Leonhart and sensitive drums of Joe Ascione, Higgins plays these popular songs with elegance and restrained passion. His musical ideas are always flowing and harmonies beautiful. Highlights include "Nardis" where the trio picks up the tempo and intensity, "Dear Old Stockholm" (the No. 1 choice of fans) and "Witchcraft" (swinging Sinatra number, anyone?). Great songs, wonderfully played. And as always the case with Venus Records, great sound. Recorded in September 2002 in New York by Jim Anderson. Gate-fold paper sleeve edition. Single Layer SACD.